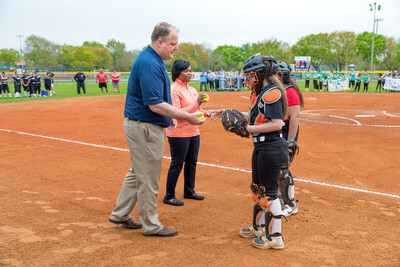 HOUSTON, March 15, 2018 /PRNewswire/ -- LyondellBasell (NYSE: LYB), one of the largest plastics, chemicals and refining companies in the world, this past weekend celebrated the completion of enhancements to four youth softball fields during the La Porte Girls Softball Association's Opening Day ceremonies. The enhancements were made at Little Cedar Bayou Park in La Porte, Texas. The project is part of LyondellBasell's participation in the Astros Foundation Community Leaders program which provides enhancements to baseball and softball fields in city-owned public parks in the Houston area. The nearly 49-acre Little Cedar Bayou Park has four softball fields, two tennis courts, two soccer fields, sand volleyball courts, horseshoe pits, a nature trail, playground equipment and a large picnic area. LyondellBasell's contribution was used to purchase new scoreboards, bleachers and safety fence caps for all four of the softball fields. These ball fields are enjoyed by more than 7,400 children, families and coaches each year. To commemorate the donation, the LyondellBasell logo will appear on the La Porte Girls Softball team uniforms. "Participation in youth sports develops important skills, such as team work, respect, honesty and fair play, and leadership," said Chris Cain, LyondellBasell's La Porte site manager. "This partnership isn't just about enhancing youth ball fields but also about promoting positive values, an active, healthy lifestyle and giving back to this great community." Opening Day festivities included a team parade of all 8 teams in the La Porte Girls Softball Association. Exhibition games were played and Mr. Cain threw out the ceremonial first pitch. "Community investments, such as the enhancements of Little Cedar Bayou, help our organization connect with Houston-area children in a tangible way," said Astros Foundation Executive Director Twila Carter. "The continued support of companies like LyondellBasell makes the Community Leaders program possible." "We are very pleased with LyondellBasell's efforts to improve the communities where they operate," said La Porte City Manager Corby Alexander. "In addition to helping our economy by bringing more jobs to the area through the construction of the new plant here in La Porte, we appreciate the company is making a long-term investment in our community." The company's La Porte Complex is one of LyondellBasell's largest manufacturing facilities spanning approximately 550 acres and is the site of a new High-Density Polyethylene (HDPE) plant that will be the first in the world to employ LyondellBasell's proprietary Hyperzone PE technology. Their neighboring Channelview Complex will be the home of the world's largest propylene oxide (PO) and tertiary butyl alcohol (TBA) plant. In addition to improving the softball fields in La Porte, LyondellBasell has committed to advancing a culture of safety on and off the field. Since announcing their partnership with the Astros Foundation in April 2017, the company honored more than 1,000 employee and community emergency response units at the Astros' 2017 First Responders Night. The opening ceremonies of the game featured first responders lining the base paths and unfurling the American flag. The company gave away travel first aid kits to the first 10,000 fans in attendance. LyondellBasell's global philanthropic efforts are focused in the areas of education, health, environment and providing support for first responders. The company remains an active supporter of many local organizations, including MD Anderson Cancer Center, Barbara Bush Houston Literacy Foundation and Galveston Bay Foundation. The company has also actively supported the Harris County Sheriff's Industrial Unit Deputies and the Houston Police Department. LyondellBasell (NYSE: LYB) is one of the largest plastics, chemicals and refining companies in the world. Driven by its 13,400 employees around the globe, LyondellBasell produces materials and products that are key to advancing solutions to modern challenges like enhancing food safety through lightweight and flexible packaging, protecting the purity of water supplies through stronger and more versatile pipes, and improving the safety, comfort and fuel efficiency of many of the cars and trucks on the road. LyondellBasell sells products into approximately 100 countries and is the world's largest licensor of polyolefin technologies. In 2018, LyondellBasell was named one of the "World's Most Admired Companies" by Fortune Magazine. More information about LyondellBasell can be found at www.lyondellbasell.com. The Astros Foundation is the official 501(c)(3) team charity of the Houston Astros. The Foundation seeks to harness the passion of baseball fans in the Greater Houston area to support its cornerstone charitable programs, including Community Leaders, the Astros Urban Youth Academy and the Astros RBI (Reviving Baseball in Inner Cities).